As this week has shown (and will continue to show), it seems like Kellogg's and also Special K are bringing the heat recently with all sorts of new products. Seemingly on every trip I make to the store recently, there is at least a new Kellogg's products, some of which I've touched on here. They are also loading up the Sunday paper with coupons in my area, so armed with one of those coupons on a recent trip, I decided to pick up a box of these Kellogg's Special K Chocolatey Pretzel Cereal Bars on sale with my coupon for $2.49. The box has six bars and each bar comes in at 0.77 ounces with 90 calories and a laughable one gram of protein. 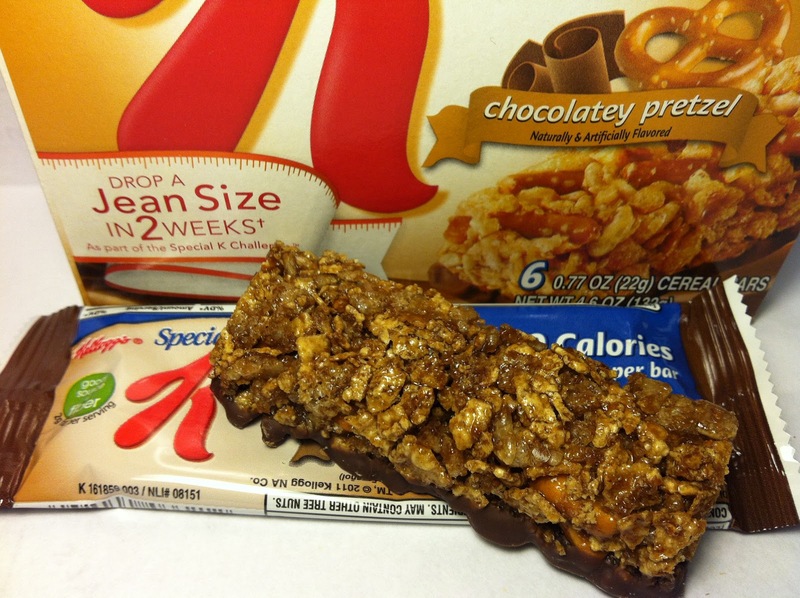 It is a cereal (breakfast) bar after all, so the lack of protein should not be surprising. Opening this up, the first thing I noticed was that the chocolate base layer was quite thick and in fact, I was pleasantly surprised by that. There was also a fair bit of cocoa dust in the cereal mix too, so based on that, the naming of the bar as chocolatey was accurate. The cereal mix of the bar also included several large sized pretzel pieces so in terms of correlating a name of a product to its actual make up, Kellogg's and Special K get a gold star for the day. Biting into the bar, the first thing you taste is the chocolate base and it is sweet and thick. The pretzels then bring a crunchy, albeit an airy one, component to the bar and the cereal mix brings the bulk of the crunch. One thing to note is that the pretzels, as pretzels often are, were quite salty. With that saltiness of the pretzels and the sweetness of the chocolate, they certainly succeeded with the sweet and salty mix in this bar, although I would say that it is more salty than sweet. Buy It or Fly By It? Being that this is a cereal bar, one could infer that this is a breakfast bar and this would not be my first option for breakfast because of the salt factor (not a fan of salty breakfasts). If I were to approach this as a snack bar, I'd definitely choose this one because on flavor alone, this gets a BUY IT rating. 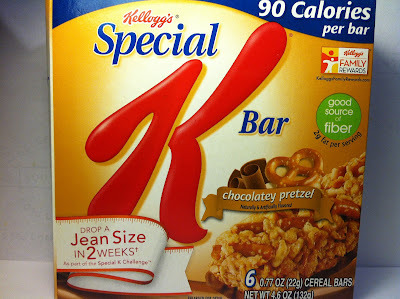 This is a good bar and a definite winner in the ever expanding stable of Special K products. Yep, I do 2-2.5 hours of cardio per day.